Darnit. I’ve had this blog subject saved for months, ready to use it in the inevitable event that the New York Yankees have a modicum of success. Not that I’m a fan; in fact, I’m probably the opposite. Because my immediate forebear (my Dad) passed on his extreme dislike (his extreme like of the Pittsburgh Pirates peaked 51 years ago when they took the World Series over the Bronx Bombers), it’s mildly disappointing that I failed to submit a timely account of their playoff demise. Well, in case you’ve instead been following football, lamenting the final episodes of Breaking Bad, or just enjoying the Indian summer, they were knocked out by the Detroit Tigers (either word, of course, can’t be spelled without T-I-E). 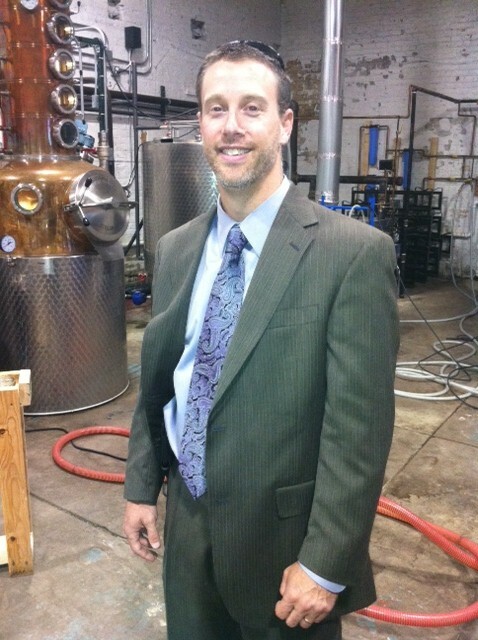 So, after several tie-less days, I finally sported another for a Few local sales calls for Few Spirits. Longtime destination Tommy Nevin’s Pub (T-I-E again) was first on my list, and so we’ll have our stuff there very soon. I also furthered our cause at Bar Louie and the Celtic Knot. We’ll be everywhere, man! 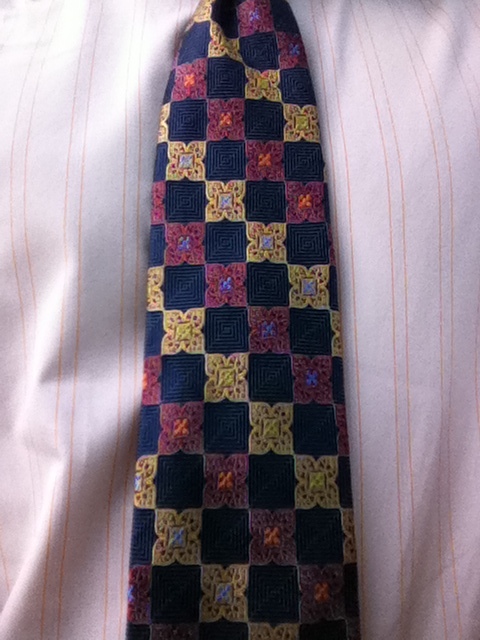 My Tie du Jour for the occasion is a lovely, patterned strip from one of my faves, Paul Fredrick. I picked this one up at Classy Closet resale shop, along with several other PF TdJ’s-to-be. The dark navy field is a perfect plot for the differently-colored medallions that regaled my light orange striped shirt. Although I had not worn a tie in several days, we did have a new Guy With Tie pay us a visit. Scott Wright is a commercial loan officer from Charter One Bank. Our local branch manager, Raquel Hernandez, set up a meeting for us, and she and Scott niced up our distillery for a Few minutes.